Our Kids at Home: just do something. edited: We met our $500 goal in 3 days! Thank you so much to everyone who made it possible. It was so much fun watching our donations go up and up everyday. This really has been such a blessing to witness and we are truly thankful to each and every one of you that donated. And even though it is so exciting to reach our goal we can still accept donations. Realizing that it might be hard for some to give, but I am talking $5 maybe $10. Any amount is precious and important to this foundation. Please just click on our link at the bottom of this post and donate what you can. 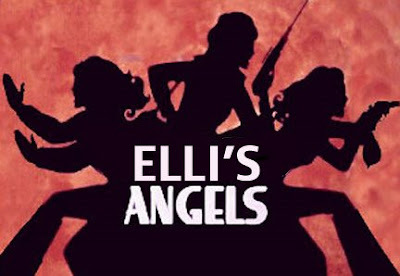 Lots of Love, The Elli's Angels Team (Jeff, Alicia, Megan, Lauren and Jack). the answer is just do something. anything. we have 2 people we know and love dealing day in and day out with diabetes. 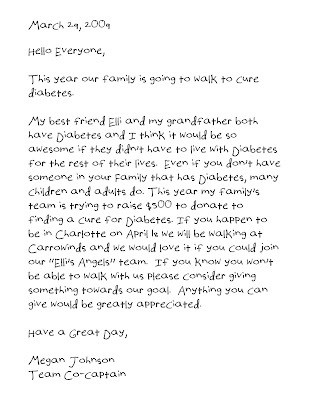 we really have wanted to do something about it, but again we feel like we are just one, okay 5.
yesterday megan and i got home from church and knew we were going to start a team to walk at the JDRF walk on april 18 at Carrowinds. i asked megan to write the letter to family and friends. this is the letter. we are pumped. we are charged. please join us if you can on the 18th. we would love to have company. please consider donating to our walk. all you have to do is click here Elli's Angels and it will take you right to our walk page. it is safe and secure to donate on their website. That is soo great that your going to walk! Wish i was there to walk with you! What can I say...the love is overwhelming!!! Thank you so much for making this so important! We love you and wish we could walk with you guys! next year let's plan to walk together!! !